Western meadowlark; photo by Kevin Cole on Wikipedia (use permitted with attribution). 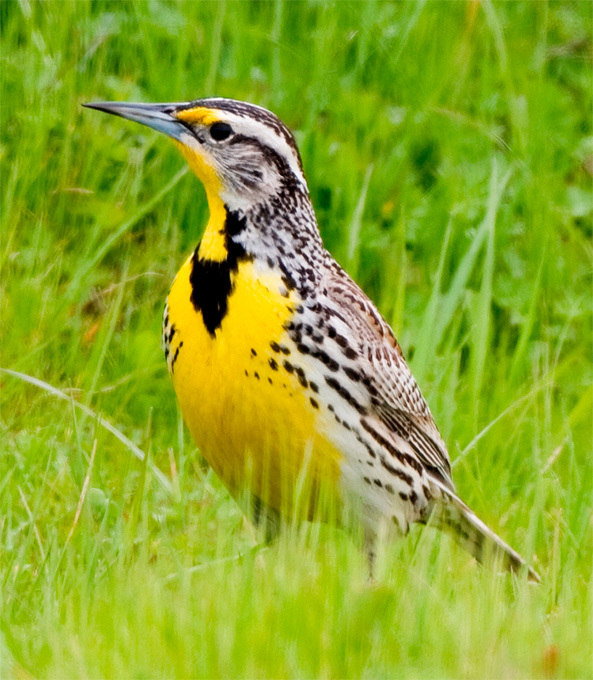 The western meadowlark is a familiar songbird of open country across the western two-thirds of the North American continent (it's also the state bird of Kansas, Nebraska, Wyoming, Montana, and North Dakota). In the same family as blackbirds and orioles, adults are 8-11 inches long and have a black and white striped head; a long, pointed bill; yellow cheeks; bright yellow throat; and a distinctive black "V" on breast. 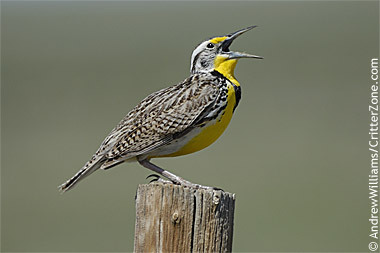 The western meadowlark is often seen perched on fence-posts in grasslands and agricultural areas singing its distinct 7-10 note melody (their flute-like song usually ends with 3 descending notes).